The Nonfiction Detectives: Interview with Monica Kulling and Review of Going Up! Interview with Monica Kulling and Review of Going Up! The reviewers received a copy of the book from the publishers. Inventors are popular subjects in the biography section. Most biography sections are chock full of books about Benjamin Franklin, Thomas Edison, and Henry Ford. We're fortunate that Monica Kulling sheds light on little known inventors with her Great Idea series. 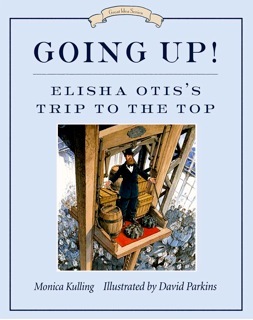 Kulling focuses on the life and work of Elisha Otis and his "people-hoisting machine" (also known as the elevator) in Going Up! Elisha Otis's Trip to the Top. Kulling engages readers with her narrative style and fast-paced storytelling. She keeps the story moving without leaving out important details. As a librarian who frequently reads aloud picture book biographies to classes, I appreciate that Kulling provides the time period and location on the first page of the story. "It was 1818, and Elisha Otis was seven. He loved watching farm machines at work. The hay hoist was the most fun of all. The ropes broke often, and when they did-SNAP!-the hay came tumbling down." Otis was an idea man. During the construction of a bed-frame factory in Yonkers, Otis worried that heavy machinery would hurt workers if it came crashing down as it was moved to the second floor. Otis invented a safety brake that attached to a platform. It worked so well at moving machinery that Otis decided it would work for moving people. Children who enjoy figuring out how things work will be inspired by Otis's ingenuity. Detailed pen, ink and watercolor illustrations depict history while also being kid-friendly. Parkins effectively captures the expressions on the faces of people throughout the book. In one illustration, Elisha looks eagerly at his boss who is delighted with Otis's plans for a new bed rail machine. In the background, readers can see the forlorn look on a worker's face as he makes a bed rail by hand. A note at the end of the book provides more details about Otis's first elevator and how his invention made skyscrapers a possibility. The next time a child needs a biography for a school assignment, pull out Going Up! It is sure to captivate readers while teaching them something new. 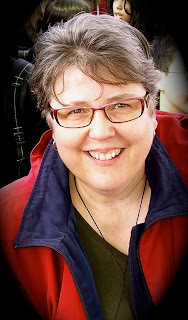 Louise had the pleasure of interviewing author, Monica Kulling. Kulling is the author of a number of picture book biographies including In the Bag: Margaret Knight Wraps it Up and It's a Snap: George Eastman's First Photograph.